This week we had the first day of summer, and what better way to celebrate than a visit to the Lake Apopka Wildlife Drive (LAWD)? It’s been a while since I got out, and I savored every moment, although all I saw were “ordinary” birds. Lots of juveniles growing up, and a wading bird convention off Lust Road with lots of fishing egrets and ospreys. There were tons of wading birds along the far end of Lust Road, past the Crazy U and almost at the pump house. The water level seems to be lower than I’ve seen it since Hurricane Irma re-shaped the wildlife drive. The water was full of fish, which attracted the birds. 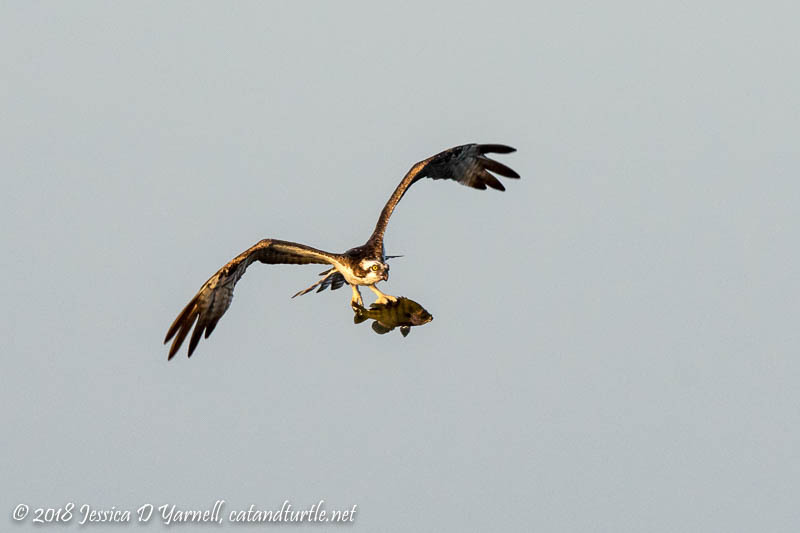 Dozens of Snowy Egrets, a few Great Blue Herons, and a half dozen Osprey spent the morning flying low and grabbing fish. 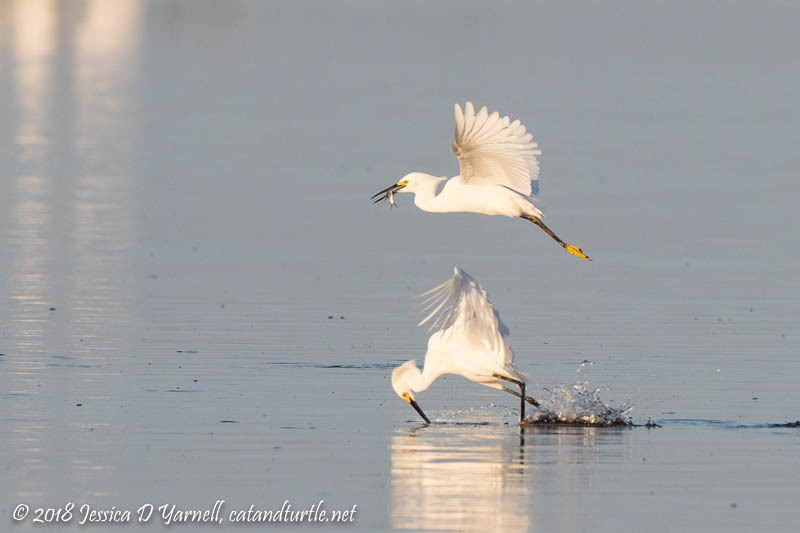 I especially enjoyed watching the snowies, who looked like they walked on water as they pulled out minnow after minnow. 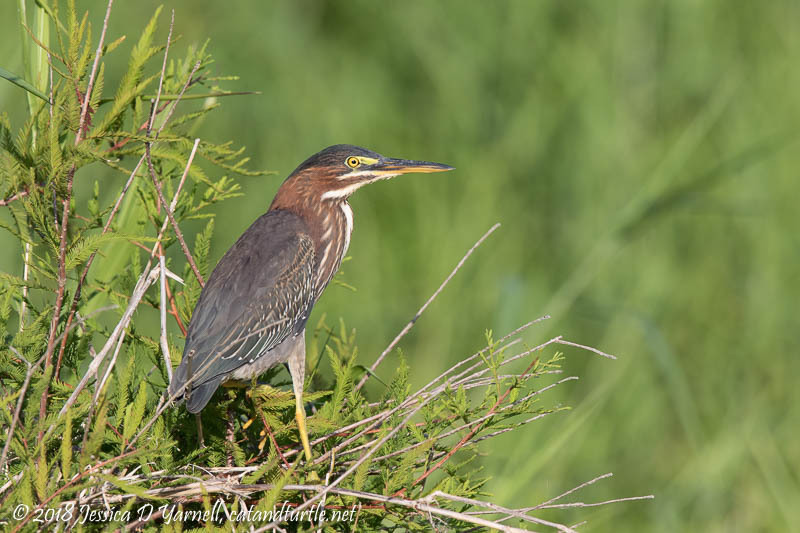 I stopped to listen the sounds of nesting wading birds in the distance, and then I noticed two Green Heron juveniles in the foreground. You can tell they are juvies with their disheveled feathers sticking straight up from their heads. 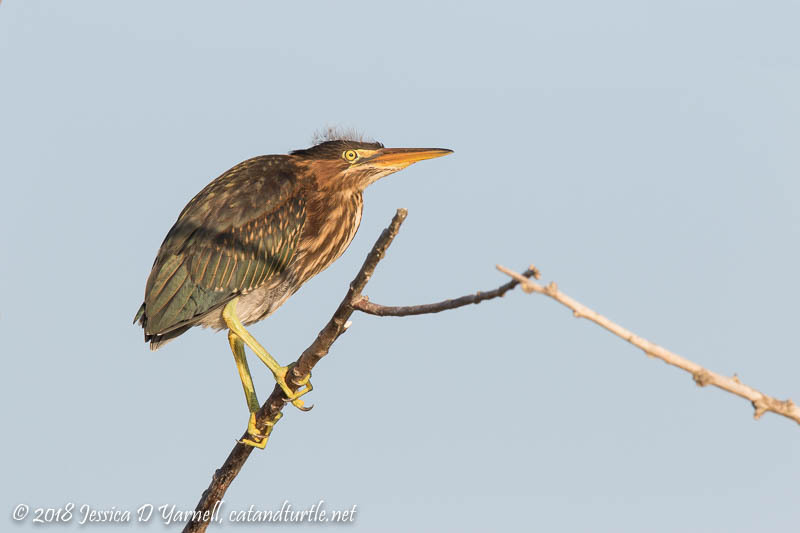 It was a good day for Green Herons. I saw them periodically throughout the drive. My favorite shot was taken on Laughlin by the bathrooms, where the bird was perched in some vegetation with some nice far-off greenery in the background. The bird gave me a good head angle for a second or two and then flew off in search of his breakfast. 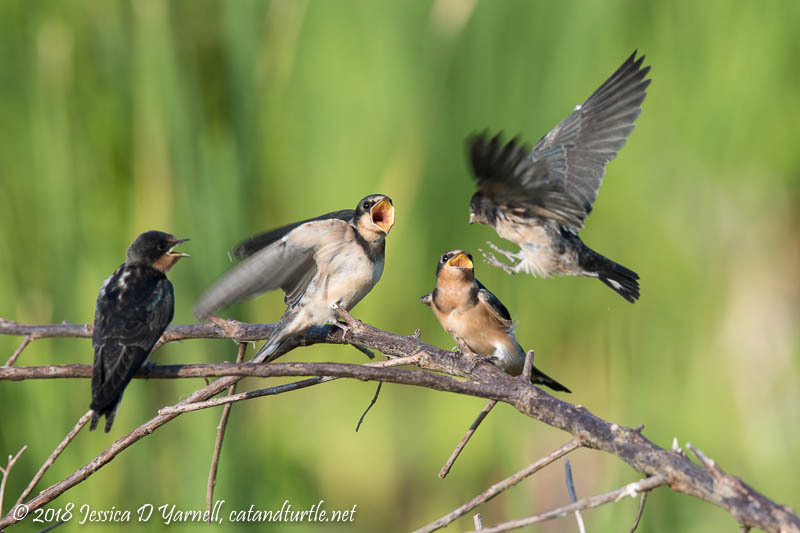 Dozens of Barn Swallows met me in their usual nesting sites. I spotted a family of juveniles perched out on a branch. They seemed hungry, and one bird was definitely young enough that he still needed to be fed by Mom. I watched for a while, but Mom never came by with a bug. But the birds still gave me cute moments, every time a bird flew by close enough to make them beg! My last bird of the morning was one I heard before I saw. 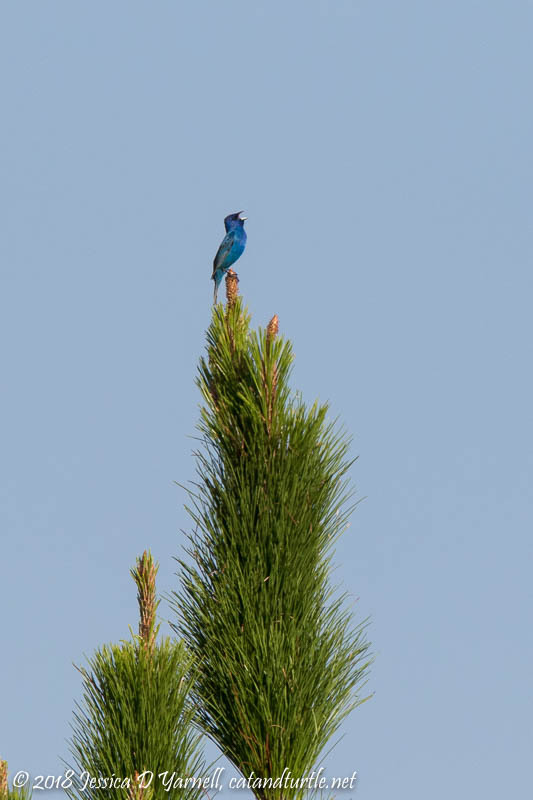 “Sweet, sweet, sweeter, sweeter.” Along Lake Level Road, you can spot Indigo Buntings sitting in the tops of the pine trees singing their hearts out. It takes a long lens and a good crop, but they make a pretty picture!